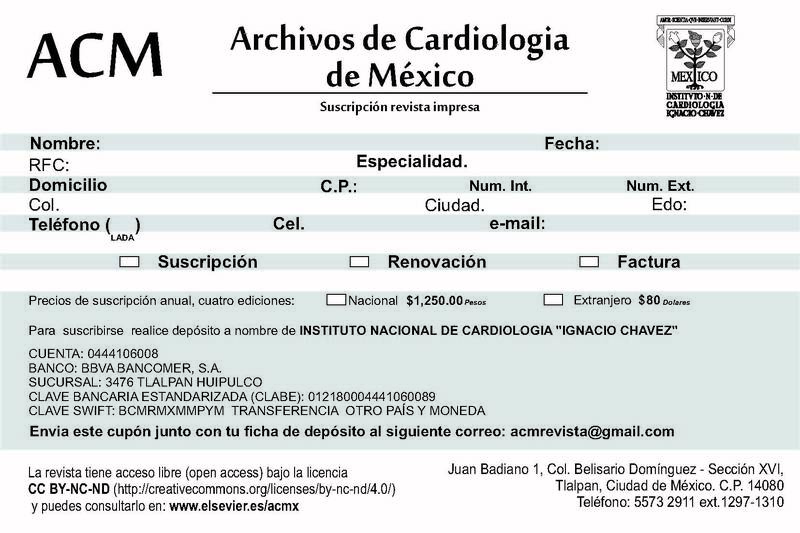 Corresponding author at: Calle Dr. Márquez 162, Colonia Doctores, Delegación Cuauhtémoc, 06720 Ciudad de México, CDMX, México. Table 1. Characteristics of clinical trials and patients included. To evaluate the efficacy of natriuretic peptide (NP)-guided therapy compared to clinically-guided therapy in reducing mortality and hospital admissions in chronic heart failure (HF) patients. Randomised clinical trials (RCT) were selected through a systematic review. Four meta-analyses were conducted for the outcomes of overall mortality, HF-related mortality, overall hospital admissions, and HF-related hospital admissions. Heterogeneity between studies and publication bias were also assessed. Nine RCTs were found with a total of 1914 patients. NP-guided therapy significantly reduced overall mortality and HF-related hospital admissions. No significant results were found for HF-related mortality and overall hospital admissions. Some clinical heterogeneity regarding interventions performed was found between studies. Publication bias was found for HF-related and overall hospital admissions. NP-guided therapy seems to improve outcomes compared to clinically-guided therapy. However, heterogeneity found between interventions might reduce the generalisation of these results. Specific interventions of the clinical trials should be examined when making recommendations regarding NP-guided therapy. Evaluar la eficacia de la terapia guiada por el péptido natriurético (PN) en comparación con la terapia guiada clínicamente para reducir la mortalidad y la hospitalización de la insuficiencia cardiaca (IC) crónica. Los ensayos clínicos aleatorizados fueron seleccionados a través de una revisión sistemática. Cuatro metaanálisis se realizaron para los resultados de mortalidad general, mortalidad por IC, hospitalización general y la hospitalización por IC. Se evaluó la heterogeneidad entre los estudios y el sesgo de publicación. Nueve ensayos clínicos aleatorizados se encontraron con un total de 1,914 pacientes. La terapia guiada con el PN reduce significativamente la mortalidad general y la hospitalización por IC. No se encontraron resultados significativos para la mortalidad por IC y la hospitalización general. El sesgo de publicación se encontró para las hospitalizaciones por IC y globales. La terapia guiada por PN parece mejorar los resultados en comparación con la terapia guiada clínicamente. Sin embargo, la heterogeneidad encontrada entre las intervenciones podría reducir la generalización de estos resultados. Las intervenciones específicas de los ensayos clínicos deben ser analizadas al hacer recomendaciones con respecto a la terapia de guiada por PN. Chronic heart failure (HF) is associated with high morbidity and mortality rates.1 The availability of a wide range of treatments (including angiotensin-converting enzyme inhibitors, angiotensin receptor blockers, beta-adrenergic blockers, and spironolactone), is not still enough to improve outcomes.2 An incorrect dose titration can lead to a poor response to HF treatment. Natriuretic peptides (NP) are biomarkers of endoventricular myocardial strain associated with the progression of HF.3–5 In the last decade, some studies have tried to show the potential of both B-type Natriuretic Peptides (BNP) and N-terminal pro-BNP (NT-pro BNP) plasma concentration as valid indicators to drive HF treatment.6,7 These biomarkers are proposed as parameters able to lead dose titration in HF patients. Multiple studies have compared whether NP-guided management could improve results compared with usual strategy based on assessment of clinical status. The aim of this study was to evaluate whether NP-guided therapy, compared to clinically guided therapy, improves clinical results in HF patients. Meta-analyses of the available evidence were performed for four outcomes: overall mortality, HF-related mortality, overall hospitalization, and HF-related hospitalization; including the most recent clinical trials. A computerized search was performed between 2000 and 2014 using biomedical databases Cochrane, Medline, EMBASE, with the keywords “Natriuretic Peptide, Brain” AND “Heart Failure”. Searches were performed using Mesh terms and free text in order to find the, non-indexed, most recent publications. Gray literature was searched on the database clinicaltrials.gov. A manual search was performed from the references of selected studies. Whenever possible, limits were used for language: Spanish and English; and type of study: randomized clinical trials (RCT). Study selection was done by pairs, resolving disagreements by consensus. Included studies were those answering the question: “The modification of drug therapy in HF patients based on the NP monitoring, compared to clinically-guided therapy, is effective in reducing the frequency of mortality and hospitalization events?”. The exclusion criteria for selecting articles were: language (other than English or Spanish); publication type (other than RCT); not answering the outlined question; and those studies which did not report any of the outcomes defined or which did not report the outcomes as absolute number of patients. Data extraction was done by pairs, resolving disagreements by consensus. The outcomes extracted were overall mortality, HF-related mortality, overall hospitalization, and HF-related hospitalization provided as absolute numbers of patients. Odds ratios (OR) and 95% Confidence Intervals (CI) were calculated for each individual trial from the absolute numbers reported for the outcomes under evaluation: overall mortality, HF-related mortality, overall hospitalization, HF-related hospitalization. Pooled OR and 95% CI were calculated for each of the four outcomes. The limit for statistical significance was set at p≤0.05. Heterogeneity was studied through the Cochran Q test and I2 statistic. For the Q test p-value of 0.10 was taken as the limit of significance.9I2 was classified into low (25–50%), medium (51–75%) and high (<75%) heterogeneity. When significant heterogeneity was not found, the studies were combined using fixed models using the Mantel-Haenszel. When heterogeneity was detected, random effects models (DerSimonian-Laird method) were used. Forest Plot graphs were used to represent the effectiveness of the intervention compared to the control group, in terms of OR. Publication bias was assessed by Funnel plots and Begg and Egger methods. Data were analyzed using STATA (version 11.0, Stata Corp., College Station, TX, USA). Initially, 1213 articles were identified of possible relevance to the study, of which 27 were analyzed in full text to decide their eligibility. Finally, 9 articles were included in the systematic review and meta-analyses10–18 (Fig. 1). The mean follow up was 11.9±6.1. The total number of patients was 1914 with mean age of 70.0±4.8, being men 55.9% (Table 1). Flow-chart. Literature search and selection of articles. Characteristics of clinical trials and patients included. I, intervention group; C, control group. The Cochran Q test and I2 statistic detected significant heterogeneity or the outcomes of HF-related mortality and HF-related hospitalization; therefore, random effects models were used. Meta-analyses for overall mortality and overall hospitalization were performed using fixed effects models. Seven studies provided data on overall mortality.11–17 The mortality risk decreased significantly in patients under NP-guided therapy (OR, 0.733, 95% CI, 0.568 to 0.946, p=0.017, I2=0%). Only one study reported an OR above 1; however this effect was not statistically significant and the study represented a very small weight (1.88%)17 (Fig. 2). Individual OR and meta-analysis/Funnel plot of publication bias for overall mortality. Begg's (p-value=0.881) and Egger's (p-value=0.718) tests and funnel plot (Fig. 2) showed a low publication bias for this outcome. Three studies provided data on mortality associated with HF.10,12,15 The difference in mortality risk between groups was not statistically significant; neither globally (OR, 0.699, 95% CI, 0.26–1.89, p=0.479, I2=42.5%), nor for any of the studies individually (Fig. 3). Individual OR and meta-analysis/Funnel plot of publication bias for HF-related mortality. Begg's (p-value=0.602) and Egger's (p-value=0.441) tests and funnel plot (Fig. 3) showed a low publication bias for this outcome. Five studies reported information on this outcome.6,10–12,15 The risk of hospitalization did not decreased significantly in the group with NP-guided therapy (OR, 0.801, 95% CI, 0.622–1.033, p=0.087, I2=0%). None of the studies reported statistically significant results either (Fig. 4). Individual OR and meta-analysis/Funnel plot of publication bias for overall hospitalization. Begg's (p-value=0.014) and Egger's (p-value=0.025) tests and funnel plot (Fig. 4) showed a significant publication bias for this outcome. Four studies were included for this outcome.12,15,17,18 The risk of hospitalization associated with HF decreased significantly in the group with NP-guided therapy (OR, 0.530, 95% CI, 0.287–0.979, p=0.043; I2=67.1%). Two of the studies evaluated found statistically significant results for this outcome.15,18 Only one clinical trial reported an OR above 1; however this effect was not statistically significant and the study represented a very low (16.86%) weight17 (Fig. 5). Individual OR and meta-analysis/Funnel plot of publication bias for HF-related hospitalization. Begg's (p-value=1) and Egger's (p-value=0.957) tests and funnel plot (Fig. 5) showed a significant publication bias for this outcome. This study did not show a significant effect of NP-guided management on HF-related mortality and all-cause hospitalization. Again, the same result was obtained by another meta-analysis evaluating all-cause hospitalization.19 None of the previous meta-analysis evaluated the outcome HF-related mortality. Considering the primary evidence, only two of the clinical trials included in the meta-analyses showed a significant positive effect for NP-guided management, decreasing HF-related hospitalization.15,18 The rest of the studies did not have statistically significant results for any of the outcomes evaluated; although, there was a general trend favoring NP-guided management. Another limitation arises from the difficulty of blinding physicians and patients for these interventions. This lack of blinding in most of the studies might overestimate the positive results found for NP-guided management. Also, taking into account that patients in the intervention group have more frequent visits to health care professionals, it is not straightforward to attribute the intervention effect to the NP monitoring rather than to a more stretch control of the patients. Guided management of HF patients through NP monitoring seems to have a clinical benefit represented as mortality and hospitalization reductions. However, given the clinical heterogeneity found between the studies, these results should be examined cautiously and take into account the specific interventions perform for each study. K.K. Ho, J.L. Pinsky, W.B. Kannel, et al. The epidemiology of heart failure: the Framingham Study. J.J.V. McMurray, S. Adamopoulos, S.D. Anker, et al. A.J. De Bold, K.K. Ma, Y. Zhang, et al. The physiological and pathophysiological modulation of the endocrine function of the heart. B.A. Groenning, I. Raymond, P.R. Hildebrandt, et al. Diagnostic and prognostic evaluation of left ventricular systolic heart failure by plasma N-terminal pro-brain natriuretic peptide concentrations in a large sample of the general population. M.F. McGrath, M.L.K. de Bold, A.J. de Bold. The endocrine function of the heart. Should B-type natriuretic peptide be measured routinely to guide the diagnosis and management of chronic heart failure?. Chronic heart failure: the management of chronic heart failure in adults in primary and secondary care. C.W. Yancy, M. Jessup, B. Bozkurt, et al. ACCF/AHA guideline for the management of heart failure. J.P.T. Higgins, S.G. Thompson, J.J. Deeks, et al. L. Beck-da-Silva, A. de Bold, M. Fraser, et al. BNP-guided therapy not better than expert's clinical assessment for beta-blocker titration in patients with heart failure. M. Pfisterer, P. Buser, H. Rickli, et al. BNP-guided vs symptom-guided heart failure therapy: the Trial of Intensified vs Standard Medical Therapy in Elderly Patients With Congestive Heart Failure (TIME-CHF) randomized trial. P. Karlström, U. Alehagen, K. Boman, et al. Brain natriuretic peptide-guided treatment does not improve morbidity and mortality in extensively treated patients with chronic heart failure: responders to treatment have a significantly better outcome. H. Persson, H. Erntell, B. Eriksson, et al. Improved pharmacological therapy of chronic heart failure in primary care: a randomized Study of NT-proBNP Guided Management of Heart Failure–SIGNAL-HF (Swedish Intervention study–Guidelines and NT-proBNP AnaLysis in Heart Failure). L.W.M. Eurlings, P.E.J. van Pol, W.E. Kok, et al. Management of chronic heart failure guided by individual N-terminal pro-B-type natriuretic peptide targets: results of the PRIMA (Can PRo-brain-natriuretic peptide guided therapy of chronic heart failure IMprove heart fAilure morbidity and mortality?) study. P. Jourdain, G. Jondeau, F. Funck, et al. Plasma brain natriuretic peptide-guided therapy to improve outcome in heart failure: the STARS-BNP Multicenter Study. R.W. Troughton, C.M. Frampton, T.G. Yandle, et al. Treatment of heart failure guided by plasma aminoterminal brain natriuretic peptide (N-BNP) concentrations. M. Anguita, F. Esteban, J.C. Castillo, et al. Usefulness of brain natriuretic peptide levels, as compared with usual clinical control, for the treatment monitoring of patients with heart failure. J.L. Januzzi Jr., S.U. Rehman, A.A. Mohammed, et al. G. Savarese, B. Trimarco, S. Dellegrottaglie, et al. Natriuretic peptide-guided therapy in chronic heart failure: a meta-analysis of 2,686 patients in 12 randomized trials. P. Li, Y. Luo, Y.-M. Chen. B-type natriuretic peptide-guided chronic heart failure therapy: a meta-analysis of 11 randomised controlled trials. R.W. Troughton, C.M. Frampton, H.-P. Brunner-La Rocca, et al. Effect of B-type natriuretic peptide-guided treatment of chronic heart failure on total mortality and hospitalization: an individual patient meta-analysis. M.R. Shah, R.M. Califf, A. Nohria, et al. The STARBRITE trial: a randomized, pilot study of B-type natriuretic peptide-guided therapy in patients with advanced heart failure. J.G. Lainchbury, R.W. Troughton, K.M. Strangman, et al. R. Berger, D. Moertl, S. Peter, et al. N-terminal pro-B-type natriuretic peptide-guided, intensive patient management in addition to multidisciplinary care in chronic heart failure a 3-arm, prospective, randomized pilot study.